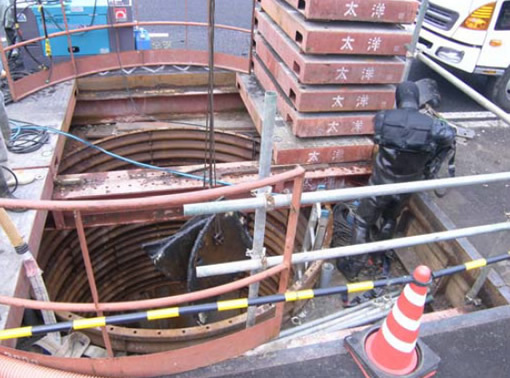 In January 2012, the Milling Mole method was used successfully in a construction project for Kishiwada City, Osaka Prefecture to remove obstructions by cutting through six Type III steel sheet piles. The tunnel had a diameter of 1000m and was 432m long. 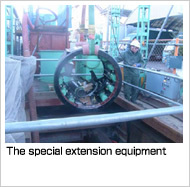 The machine first reached an intermediary passage shaft around 100m from the start of the tunnel. 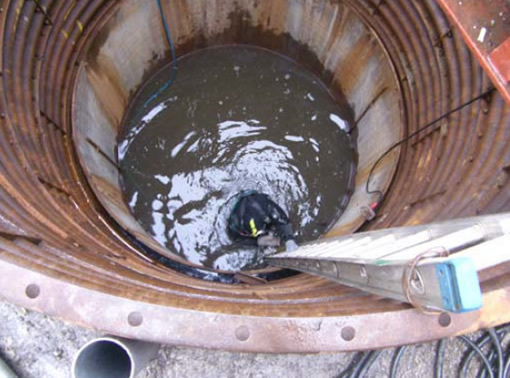 The six obstructions were located in a 30m stretch starting 80m from this shaft. 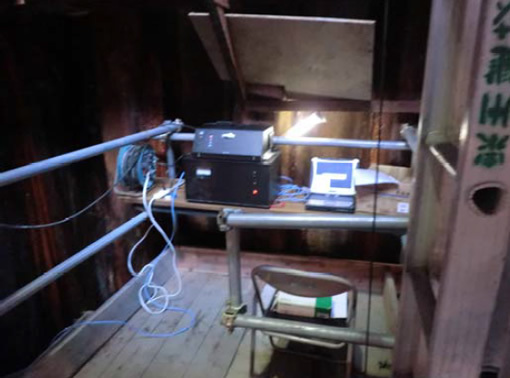 Ordinary tunneling with no obstructions resumed for the remaining 222m. 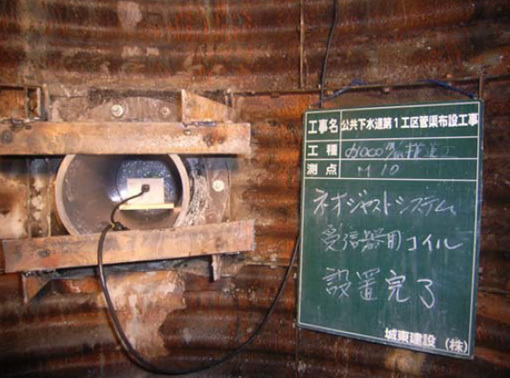 The tunneling machine detected and cut all six obstructions and reached the arrival target with high precision using the electromagnetic induction measurement device. The project took place in reclaimed ground. With layers of gravel, sand and cohesive soil, it was an extremely difficult area of ground. 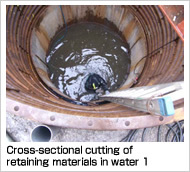 The obstructions, Type III steel sheet piles, were left from the construction of manholes for the soil pipe running parallel above the pipe to be built for this project Work was therefore conducted at a height where the full circumference of the device would pass through all six obstructions. 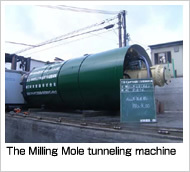 The machine first needed to reach an intermediary shaft when tunneling started. 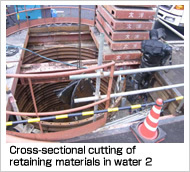 As the gravel layers meant a high risk of the ground collapsing and the area was near the Osaka Rinkaisen prefectural road, the cross-sectional cutting of retaining materials at the arrival point was performed in water for greater safety. The first obstruction was reached shortly after passing this intermediary shaft. 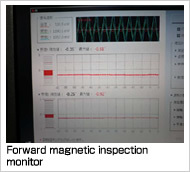 The waveforms from the forward inspection reacted before reaching the obstruction, turning blue, then orange and finally red to warn operators that the machine was getting closer to the obstruction. 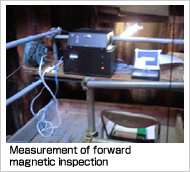 The forward magnetic inspection used in this project detected obstructions from both sides of the tunneling machine (to the left and right). The waveforms turned blue when an obstruction was 2m ahead, orange at 1m and red at 0.5m. 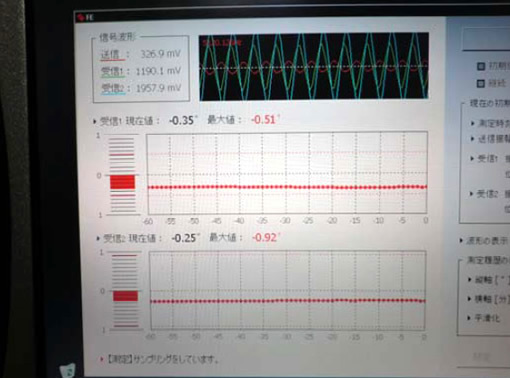 On this site, both sensors showed roughly the same waveforms and colors, showing that there were obstructions throughout the cutting section. Instead of being cut into pieces, obstructions are cut into powder and removed with earth and sand. 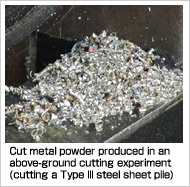 Earlier above-ground experiments produced metal fragments of 1-3cm, but due to numerous improvements, the metal removed from the site was a fine powder that could not even be seen among the earth and sand. The mixture in the removal tank could only be touched with leather gloves, as a stinging sensation was felt when touching it with bare hands. 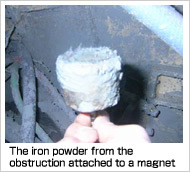 A magnet was placed in the tank and it was confirmed that the mixture contained iron powder. It may not look like it in the photograph, but the iron on the magnet is indeed a powder. 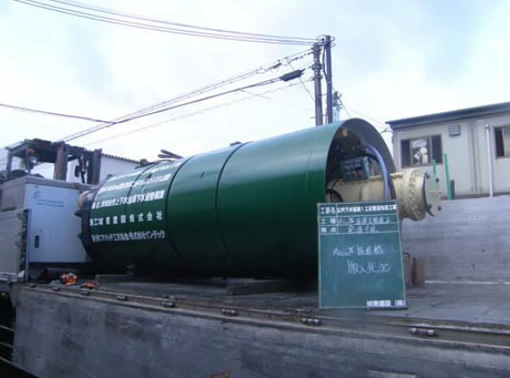 It is believed that such fine powder could also be transported in mud water, but a high ratio of sludge is removed with this method, making vacuum transportation in sludge form the most suitable method. Care also needs to be taken with the capacity of the sludge removal tanks, as the iron ratio is around 7.8. This is around four times higher than the ratio of 1.4-2.0 that usually occurs in tunneled sand and earth, and the tank therefore cannot be filled completely as it is usually. As cutting is done at an ultra-low speed, minimal earth and sand is removed, with only high-concentration mud water and the obstruction (iron powder) removed. As a result, a high ratio of 6.0-7.0 was measured in this project. 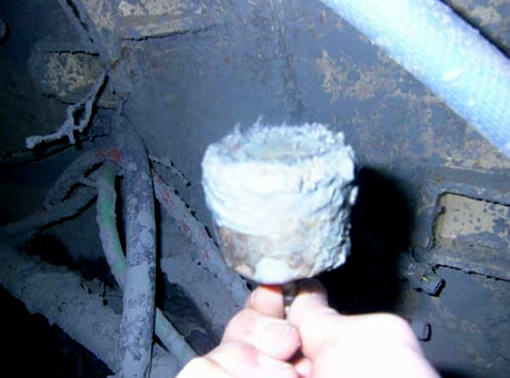 We received word that the removed mixture was essentially transported with a truck used for transporting materials such as stones instead of by vacuum transportation. It was apparently difficult to separate the iron powder from the other materials. 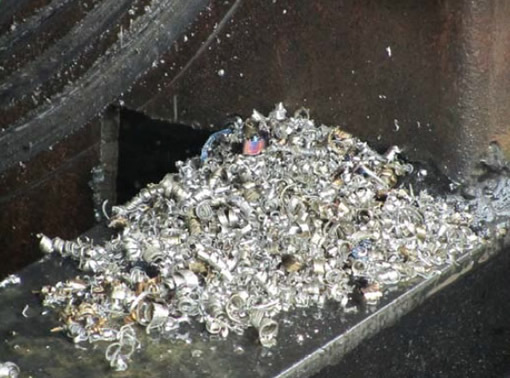 The operators could tell when the machine had finished cutting through the obstruction because they no longer heard the sound of metal being cut, but the forward inspection sensors continued reacting. 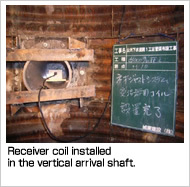 This was not because of the presence of a metal obstruction but because metal obstruction material keeps reacting until it passes the transmitter coil and receiver coil of the tunneling machine. After further cutting (tunneling), there was a reaction to the next obstruction, around 5m from the first. Although the second and third obstructions were only around 1m apart, cutting continued as successfully as the first time through all six obstructions (Type III steel sheet piles) and the machine reached the arrival target shaft. 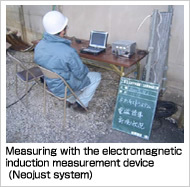 An electromagnetic induction measurement device (Neojust system) was used, allowing for highly accurate guiding of the tunneling machine. 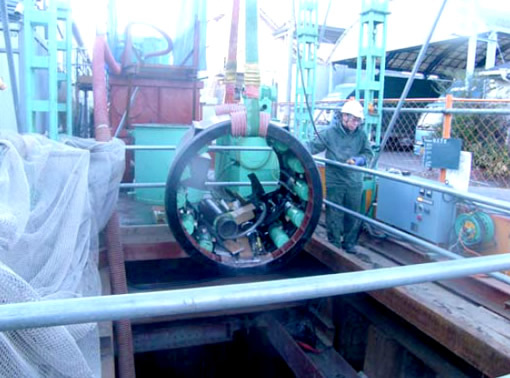 After passing the obstruction, solidifying two-component liquid lubricant is injected to reduce resistance between the obstruction and the tunneling tube. The final tunneling force of the 432m tunnel was 1200kN. The project was also finished in a short period of time ? around three months ? 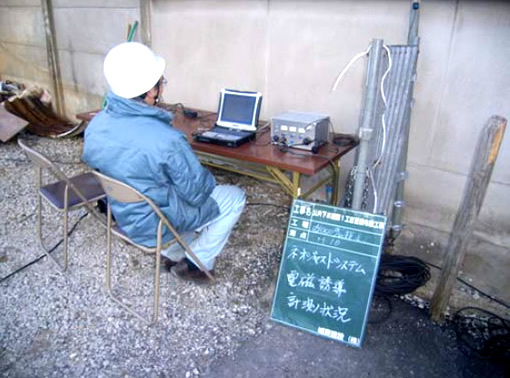 due to work being conducted day and night (16 hours a day with two teams). JYAT Association All Rights Reserved.